ORLANDO, FL--(Marketwire - Feb 7, 2012) - As one of the most popular attractions in Orlando's tourist corridor, the I-Ride Trolley Service has provided an affordable, fun and convenient way to transport visitors to the attractions, shopping, restaurants and accommodations in the International Drive Resort Area. Since it began in 1997, it has been considered the easiest way to travel, allowing visitors to park their cars, save some money and enjoy the ride. And it just got easier with the recent introduction of a new fleet of 15 trolleys equipped with a state-of-the-art automated vehicle location system (AVLS) known as NextBus. With Global Positioning System (GPS) tracking, NextBus technology provides predicted vehicle arrival information and live maps to visitors. I- Ride Trolley information is available via the Internet, smartphones and text messaging. Beginning this spring, each of the 105 Trolley stops will provide a QR tag that visitors will be able to scan for access to the resort area's mobile website where the NextTrolley information is available. Alan Villaverde, who serves as chair of the I-Drive Master Transit & Improvement District and is Managing Director of the Peabody Orlando/President/Peabody Hotels Division, says the new and more efficient transportation system provides cutting-edge visitor services. "It's fun, fast and affordable. Visitors now have the convenience of Trolley arrival information that enables them to schedule and plan their travel. We are very excited to be able to bring this technology to the I-Drive Area for our visitors to enjoy." In addition, the new trolley equipment includes security cameras on each vehicle, automatic passenger counters, automated stop announcement system, LED destination signage and LED exterior accent lighting visible day and night. Made in America! Specialty Vehicles in Henderson, NV, is the exclusive distributor for trolleys for Supreme Corporation in Goshen, IN. Riding "green"! The I-Ride Trolley's also have a "green" component. In keeping with the eco-friendliness of I-Drive, the new trolleys are equipped with Clean Diesel Technology (CDT) engines from Cummins, a technology leader in the diesel engine market. The CDT engines eliminate 90 percent of the particulate matter (exhaust pipe smoke) and over 90 percent more of the mono-nitrogen oxides (smog). The new engines are also 10 percent more fuel efficient which helps reduce green house gas (GHG) emissions. Charm and comfort. Combining the charm of the past with today's modern comforts, this exclusive transportation system for the International Drive Resort Area has logged more than 25.5 million trips since it began service in 1997 including over 2.06 million in fiscal 2011. The trolleys operate from 8 a.m. until 10:30 p.m. daily. Details along with downloadable maps may be found at www.iridetrolley.com. For information on planning a vacation in the area, visit www.internationaldriveorlando.com. 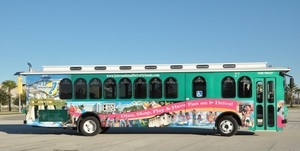 The I-Ride Trolley service is owned by the International Drive Transit & Improvement District and is operated, under contract, by the Mears Transportation Group in Orlando, FL. Created in 1992, the District is a special taxing district formed under a public-private initiative with Orange County, the City of Orlando and the businesses of the International Drive Resort Area. Recognized as an outstanding example of cooperation between three distinct entities, this is the first district of this type established in Florida and is now used by other regions as a model. The District is comprised of three separate Municipal Service Taxing Units (MSTU) that are jointly operated under this unique partnership by a Governing Board and an Advisory Board. The I-Ride Trolley Service on Orlando's International Drive recently introduced a new fleet of 15 trolleys equipped with a state-of-the-art automated vehicle location system (AVLS) known as NextBus. With Global Positioning System (GPS) tracking, NextBus technology provides predicted vehicle arrival information and live maps to visitors. As one of the most popular attractions in Orlando's tourist corridor, the I-Ride Trolley Service has provided an affordable, fun and convenient way to transport visitors to the attractions, shopping, restaurants and accommodations in the International Drive Resort Area. Since it began in 1997, it has been considered the easiest way to travel, allowing visitors to park their cars, save some money and enjoy the ride.